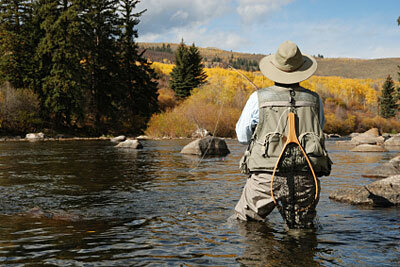 Question: There are some spots I fish where the only way I can get a fly to the trout is by casting from upstream. I have two problems. First, I find it really hard to get a good drift because the fly often drags soon after it lands. Second, when I do manage to get a strike, I miss a lot of fish. What can I do? Answer: This is a problem that plagues many anglers. When I was a guide in Yellowstone National Park, I found a fantastic spot—a deep hole where some of the largest cutthroats in the Yellowstone River would rise to the daily hatch of blue-winged olives. Because the fish held in the center of the pool, the only way to get a fly to them was to wade out on a ledge of volcanic rock and make a 40-foot straight-downstream cast, followed by a 5- to 10-foot dead drift with an Olive Sparkle Dun. Most of my clients found this presentation nigh impossible at first, but once I taught them to make “sloppy” casts, they figured it out. Once you’ve got the cast and the drift figured out, though, you’ve still got the hook-setting problem. It’s clear why hooking fish from this angle is difficult: the angler is pulling directly away from the fish’s mouth. In some cases, when the angler can see the fish rising to the fly, the temptation to set the hook before the fish even closes its mouth is too great, and the fly disappears before the fish even has a chance to grab it. So you need to learn to wait an extra beat before setting the hook. After the fish takes the fly, it will turn to head back to the stream bottom. If you set while the fish is turning, you’re more likely to bury the hook in the side or corner of the trout’s mouth. The bigger problem is the slack in the line. You need that slack to achieve the drift, but that same slack makes it more difficult to get tight to the fish. The classic rod-tip-to-the-sky setting motion may do nothing more than pick up the slack nearest you. Instead, set the hook by sweeping the rod backward, low and parallel to the water and making a quick strip. This technique removes the slack from the line and uses the tension of the line still on the water to drive the hook home. Sweep the rod to your downstream side, to avoid dragging the line across your body, where it could get caught on one of the gewgaws on your vest. Once the fish is hooked, then you can raise the tip and start stripping like a madman to remain connected to the trout.